I found a new favorite blog last week Mrs. Howard Personal Shopper . The post which caught my eye was of a teenager's room. 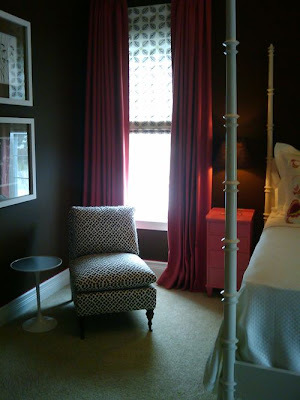 The dark brown color on the walls is dramatic yet the hot pink trim makes the paint more playful, interesting and vibrant. 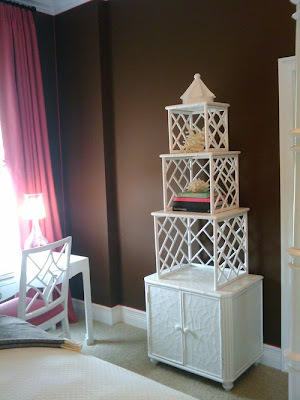 Also notice the thick crown moulding, this is a relatively inexpensive way to dress up a room. The Oly Studio bed in white with raffia has always been one of my favorites - I can't wait to get one in our master bedroom! One of my favorite elements in the room is that all of the furniture chosen is timeless and can later be used by this teen in her first apartment during or after college. The pagoda style bookshelf by Jardins en Fleur is whimsical yet hints back to timeless chinoiserie design which is all the rage now. 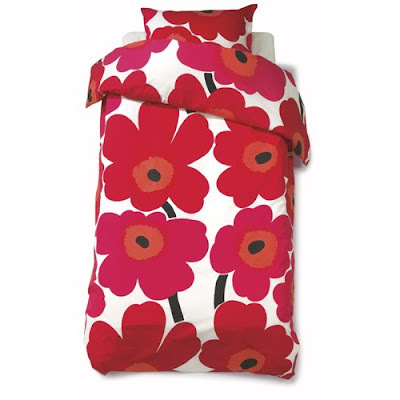 To make the room a little more playful for a pre-teen, I would choose bedding similar to the Marimekko Unikko Red Bedding seen below. 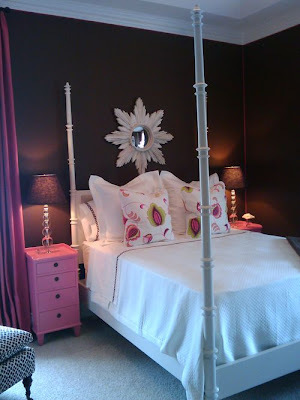 The large bright and bold print would play nicely with the white furniture and asian themed room. 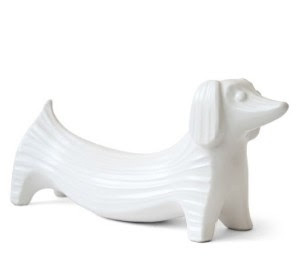 I would also substitute some white Johnathan Adler animal figurines like the dachshund in the bookcase in place of the coral to make it a little more playful.